The size, in pixels, of the smaller bitmap version of your image. When you import a bitmap image into a scene, a smaller version of it is created in order to accelerate the compositing and playback processes. 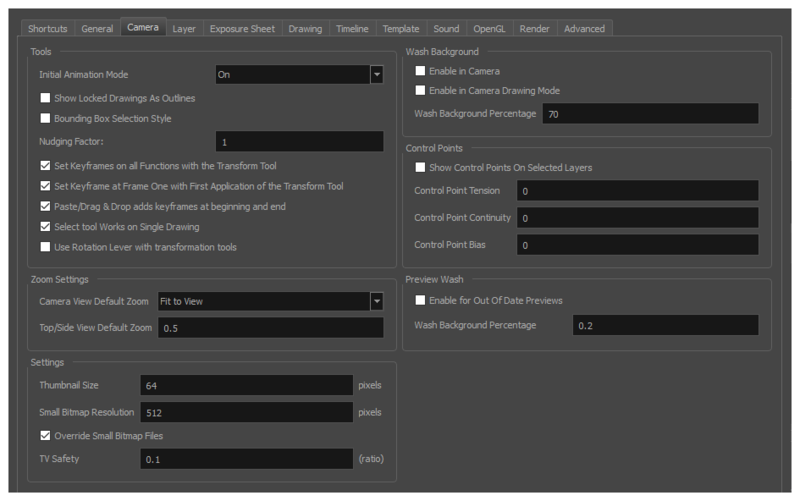 Control Point Bias: The default Continuity value for new keyframes and control points. Enable For Out of Date Previews: When you disable the automatic render preview, you must click the Update Preview button in the Rendering toolbar or the Camera view bottom toolbar in order to recalculate and update the preview. When this option is enabled, if the current render preview is out of date and requires you to press the Update Preview button, the Camera view will display the current preview as washed out colours.